Rug Hooking of Paris Hill, Maine. When I first started rug hooking, not all that long ago, I was immediately struck by the camaraderie that existed in the hooking, and larger fiber arts, community. As my teacher sat with me on the comfy sofa in our local fiber arts shop, other fiber artists – mostly knitters and hookers – flowed in and out of the store. Some were there to ask advice, some were there for supplies, and some just wanted to sit down, have a cup of coffee and work on their latest projects at this home away from home. We are blessed to have this resource in our small Maine community, and I have found it to be a tremendous benefit as I continue to learn my craft. I can’t help but think this would be a delightful Valentine’s Day gift. Interestingly, this Seven Gables pattern was the same one I learned to hook on. My version has a deep charcoal & black background. I have also seen this pattern hooked by its designer, Connie Fletcher, and it looks different still. One of the things I love about this craft is that each piece is such a strong reflection of the woman (or man!) who hooked it. 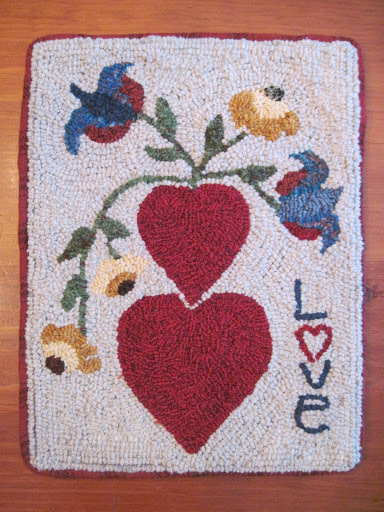 A hooked rug is not just an inanimate object – to a large degree one can sense the spirit of the rug’s maker in looking at the color choices, the loops, the hooking style, binding choices, and other elements. Rugs are individual, like we are, and yet instantly recognizable from across a room as belonging to this unique genre of North American hand craft. Hi! It’s Jennifer, the other half of Parris Wool Works. I met Beth Miller through my husband, Dan Rosenburg. You’ll be seeing his name often because he’s the artist behind many of my ideas – both in rug hooking and various other creative pursuits. I haven’t been hooking for long and sometimes feel pretty isolated here in Tennessee, so if there are any local hookers out there, I’d love to meet you. My latest pattern, “A Murder Among the Magnolias,” is a Southern Gothic inspiration in the spirit of writers such as Flannery O’Connor. Even though many of her stories end in tragedy, for a brief moment we’re allowed to peer inside the soul of her characters who all remind us of the ever-constant need for faith in a sometimes unjust world. This 20×28 pattern can be purchased on our website Parris House Wool Works. Here is the wool that I’ve picked out for this project. I’m still undecided about border colors but I think I’m going with greens or teals to pull from the magnolia leaves. The crows will be a markedly dark counterpoint against this cheerful spectrum! I’m also using multiple width wool strips, and since I don’t have very many cutter head sizes to choose from, I’ve made do by using my quilting rotary cutter (gasp!). If you have a large Omingrid ruler, the job is actually quite easy. 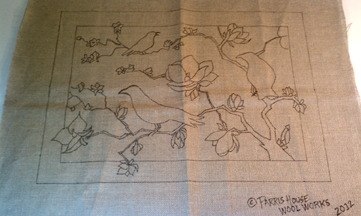 I began work on the crow pictured below on the right hand side of the pattern. The light reflects so well off a crow’s feathers, dancing in glimmers of light on his shiny, jet black body. I wanted to recreate this illusion so I added various shades of black. I used a red and blue plaid wool over-dyed with black in different sizes along the inner body of the crow. To give the beak that nice pointed shape, I started with tiny loops that gradually got bigger as I progressed down the side of the bird. Crows know no rules, and neither do we! This took some patience but I’m pleased with the finished result. I found that the different sizes of wool didn’t distract from the overall effect. 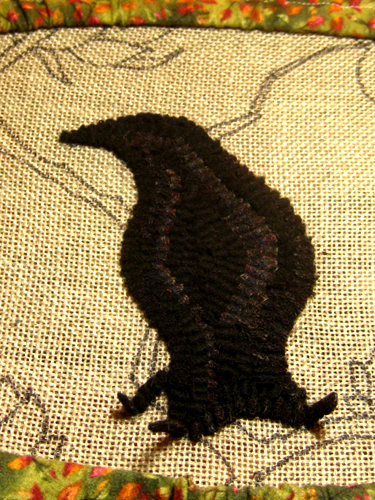 I haven’t cut the loop ends off the bottom feathers yet and tomorrow, I’m starting the tree branches. This is really a learning process and I’m excited be sharing it with other rug hookers. I’m hopeful that we can exchange ideas and I welcome all advice! Welcome to our blog! A bit of this…a bit of that…a whole lot of wool working. As I write this post I feel as though I am opening the door to my home and inviting in fellow fiber artists for a great afternoon of chat, mutual support, idea sharing and camaraderie. That’s what we hope to achieve with this blog site, but first a little bit about Parris House Wool Works. 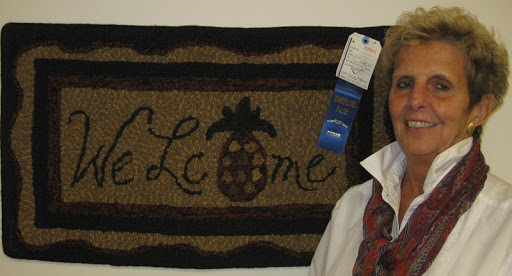 Not all that long ago, I learned the art of primitive rug hooking from experienced artist Connie Fletcher of Seven Gables Rug Hooking in Paris, Maine. Shortly thereafter, my dear friend Jen Rosenburg was visiting from Hermitage, TN and Connie taught her as well. 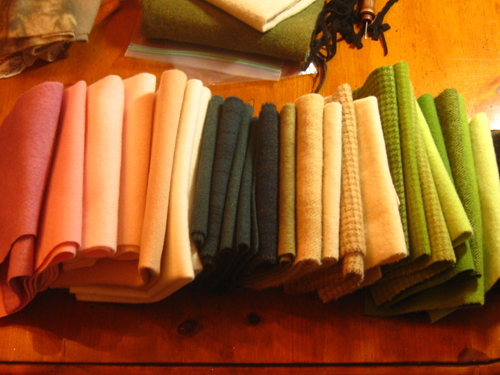 While we did not quite realize it at the time, our shared passion for this nineteenth century North American hand craft would become Parris House Wool Works. And here we are! 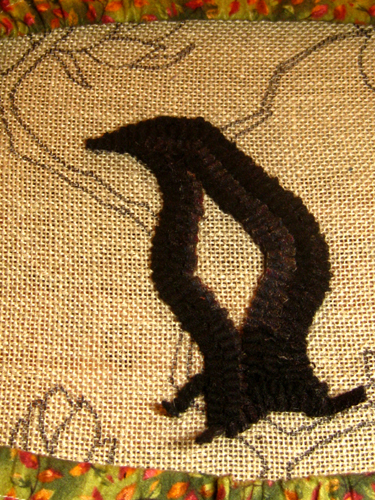 Our goal with this blog is to be your on-line resource for all things hooking, to provide fun and interesting posts about what we’re working on, places we visit (for example, last summer I visited the Rug Hooking Museum of North America and the Deanne Fitzpatrick Studio in Nova Scotia), and general essays on life in the simpler lane. Jen and I enjoy many aspects of a country lifestyle and hope to incorporate some of that in to our blog as well, perhaps including a little gardening, outdoor experiences, canning, baking, travel, what have you. At the same time we also have family and professional lives. Between us we parent six sons (Jen has two, I have four), take care of two husbands, have numerous pets and work other jobs. Jen is a microbiologist and I am a real estate broker. We feel that our environments and interests serve as muses for our rug designs, and make them more meaningful not only to us but to our customers who may share some of our interests. Just as a hooked rug is made up of a variety of colors, textures and patterns, so it is with aspects of our lives and yours, and we would like to provide an interesting and interactive forum for the wide variety of rug hookers who may visit our site. 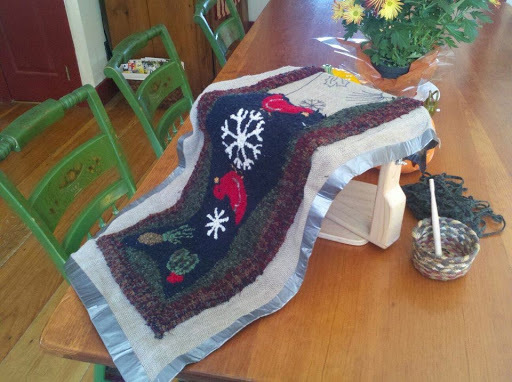 In the nearby town of Norway, Maine, I have access to a fantastic support network of hookers through Artful Hands Fiber Arts Studio, where I can sit down in a home like environment with other artisans and share experiences. However, outside of New England and the Canadian Maritimes, hooking studios are less common. We hope to provide a warm and cozy virtual space in place of a physical space for those of you who may not have access to a local studio. Jen’s Southern heritage is a fantastic resource for Parris House Wool Works as this art spreads all over the United States. We intentionally want to help foster a community of hookers all over North America and maybe even beyond (we got a European follower on our Twitter feed today!). We aim to be accessible, and we know we are still learning ourselves. If you send us a note or comment on something we don’t know, we’ll endeavor to find out and learn right along with you.